On Jeremiah's seventh Thanksgiving, his father took him deer hunting for the first time. In the cool, damp morning, Jeremiah trembled, from the weight of the gun, from fear he would miss. His father's warm breath of coffee and cigarettes, his grown-up smell of sweat, steadied him. Behind them, his brother Martin shivered under a camo blanket. Almost eleven years older than Jeremiah, Martin was a pacifist—he had never killed a deer, much less a rabbit—but their father made him go hunting anyway. “Got to make men of all my sons,” he had said. Jeremiah looked through the scope, blurred from dew, and as the buck came into focus, his shaking stopped. Jeremiah wanted this kill, bad. More than anything he wanted to show his father, his brothers, he was a man. He wanted those antlers over his bed. He wanted to give the hide to Luke. He wanted to sit down to backstrap seared on coals, sliced thin, the meat pink on the plate, and he wanted his mother to say, “Thank you, youngest son, for our food,” while Martin looked down at the table. The deer lifted his head, his tail a white flag. A thin metallic taste flooded Jeremiah's mouth. His finger curled around the trigger. Dear God, thank you for letting me take this life. He felt the recoil before he realized the bullet had connected. The deer leapt into the brush, then staggered in a circle and collapsed on wet leaves. Almost a mile above the Korengal valley, Jeremiah and Rickards holed up in the abandoned hide and waited for the insurgents to return. AK47 casings and goat turds littered the dirt floor of the stone hut. They had packed enough MREs, ammo, and water for a week but hoped for a shorter stay. Days, they patrolled the Pakistan side of the ridge. By noon, when it got too hot, they dozed on the cool ground in the hut. Despite being deep in enemy territory, they did not find evidence of the enemy. The only humans they saw were the goatherds in the meadow of the neighboring ridge. Every morning the boys herded their goats from the village up to the meadow, and every evening they brought them back to the village pens. Nights, Jeremiah guarded while Rickards slept hard curled on the ground. Rickards could sleep anywhere, any time. Jeremiah never slept more than an hour at a time. “That's why you re-upped?” Jeremiah asked. On day three, Rickards radioed down to base that Intel had been wrong, very wrong; the ridge was quiet as a mausoleum. At dusk, Rickards pissed in the holly bushes and lay down in the hard dirt. Jeremiah perched in the rocky outcropping and waited for night to fall. While Rickards slept, Jeremiah watched the goatherds and their animals return to the valley, the lights of the homes and their base below wink out, and wrote letters to Sheila in his head. Far up the northern valley, low booms and flashes of mortars and missiles, Camp Vegas taking fire from the Taliban. The moon traveled across the sky and when it was directly overhead, the faint tinkle of bells alerted him. He peered through his rifle scope. Along the path he and Rickards had taken up to the hut, a lone goatherd walked slowly, as if deep in thought, seven goats bunched around him. Every now and then the goatherd paused, his tunic dragging in the dirt, and there was something about the goatherd that made Jeremiah feel even lonelier. Rickards woke with a scream. “Lousy nightmare,” he said but did not elaborate. Hands shaking, he squatted next to Jeremiah and lit a cigarette. Smoke curled around his head. Ashes flickered at his feet. “Same kid who passes through every night,” Jeremiah said. Jeremiah raised his M4 and looked through the scope. The person walked three or four steps, then stooped, touched the ground. Dust floated around his hand. Then, the goatherd stood again and walked, his goats following. A coil of silver glinted in his hand. The goatherd stopped and turned. 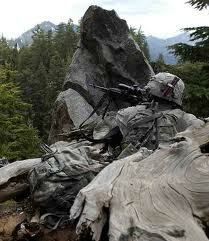 He stared up at the mountain as if he could see Jeremiah and Rickards and their M4s leveled at him. Jeremiah lowered the rifle. The goatherd started again towards the village. Jeremiah did not remember pulling the trigger. The man fell to the ground, a puddle of white. The goats scattered, bleating. “Thank you,” Jeremiah whispered, not sure who he was thanking. I like each story separately, the first because I've hunted deer and welcomed the venison on the dinner plate. The second part appealed because it contained intrigue: the exact nature of the goatherds' actvities. Together, an excellent duet. I am not sure that deerhunting prepares one for killing a human, that is, if we are to draw a parallel using young Jeremiah and mature Jeremiah. But it is an interesting probability. I like the intensity of the imagery in the piece - "A thin metallic taste flooded Jeremiah's mouth. His finger curled around the trigger. Dear God, thank you for letting me take this life. He felt the recoil before he realized the bullet had connected. The deer leapt into the brush, then staggered in a circle and collapsed on wet leaves." I think nothing prepares you for what Jeremiah is facing. And I think that's the point. Powerful, nicely threaded needle... you pull the thread and knit a fine story. Awesome. You have caught the powerful connection of childhood, time, memory and a lucid wartime present.